Penn State Extension is now offering an online Spotted Lanternfly Permit Training For Business Program to teach businesses best practices to stop its spread. Businesses operating in the quarantine zone must have permits to move equipment and goods within and out of the zone. Once the course is completed and you successfully pass the required quizzes, your company will receive a Spotted Lanternfly Business Permit. 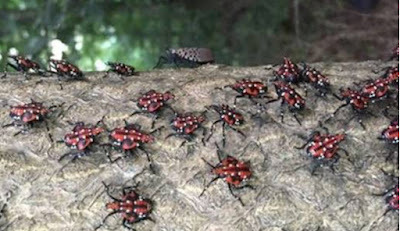 As part of the Spotted Lanternfly quarantine agreement beginning May 1, 2019, the Department’s Bureau of Plant Industry will begin to perform inspections and verification checks to confirm that businesses are properly permitted. Failure to take the permit exam and educate employees could result in possible penalties and fines. Click Here to register for this free training program. Click Here for a short video overview. In November 2017, 13 Pennsylvania counties – Berks, Bucks, Carbon, Chester, Delaware, Lancaster, Lebanon, Lehigh, Monroe, Montgomery, Northampton, Philadelphia, and Schuylkill – were placed under quarantine to help stop the spread of the Spotted Lanternfly. Find out more about Spotted Lanternfly, visit Agriculture’s Spotted Lanternfly, the USDA Lanternfly and the Penn State Extension webpages.